Before receiving their diplomas and becoming Mizzou alumni, School of Natural Resources students turn and wave to friends and family who have supported them while earning their degrees. Photo by Nicholas Benner. COLUMBIA, Mo. – During the weekend of Dec 18-20, 2,406 students will celebrate the culmination of their academic achievements during fall commencement ceremonies at the University of Missouri. Throughout the weekend, MU will award 2,591 degrees, including 1,961 bachelor’s degrees, 460 master’s degrees, 151 doctoral degrees and 19 education specialists’ degrees. MU also will recognize 317 students graduating with honors and will present actor Hal Holbrook and film festival founders Paul Sturtz and David Wilson with honorary degrees. During the Honors Ceremony on Saturday, Dec. 19, the University of Missouri will present honorary degrees to Holbrook, Sturtz and Wilson. 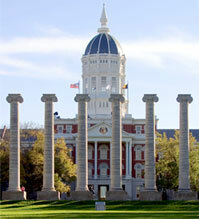 This year’s honorees join the ranks of 394 others awarded honorary degrees from MU since 1892. Past honorees include President Harry S. Truman, author Samuel Clemens (Mark Twain), newsman Walter Cronkite and singer Sheryl Crow. Sturtz and Wilson co-founded the Ragtag Film Society in Columbia in 1998 and later co-founded the True/False Film Fest that has become one of the world’s leading documentary film festivals. Sturtz has worked as an associate programmer for the Sundance Film Festival and has served on film juries around the world. In 2012, Sturtz co-directed his first film, “Dear Valued Guests,” about the late, and sometimes lamented, Regency Hotel. Wilson is a celebrated director and producer, producing “Big Birding Day,” a short film about competitive bird watching in 2010 and “We Always Lie to Strangers,” a feature length-documentary about the entertainment industry of Branson that was released in 2014. NOTE: A detailed schedule of events and biographical information of the honorary degree recipients are attached. For more information about the commencement ceremonies and Columbia accommodations, please visit http://commencement.missouri.edu. NOTE: Students in the School of Social Work will participate in the College of Human Environmental Sciences ceremony. The School of Natural Resources in the College of Agriculture, Food and Natural Resources will have a separate commencement ceremony. The Schools of Law, Medicine and the Colleges of Veterinary Medicine and Education do not hold commencement ceremonies in December. Actor Hal Holbrook is famously known for his one-man show “Mark Twain Tonight!,” which has been featured on primetime television and presented at theaters across the nation since 1954. Holbrook, a graduate of Culver Academies and Dennison University, found his passion for native Missourian and American literary giant Mark Twain while working on an honors project in his final year of study. His first show was performed at Lock Haven State Teachers College in Pennsylvania in 1954, where he was discovered by Ed Sullivan. After appearing on the “Ed Sullivan Show,” Holbrook was nominated for an Emmy Award for his performances on television in 1967. Holbrook’s career wasn’t limited to television, as he performed “Mark Twain Tonight!” on Broadway in 1966, and again in 1977 and 2005. After his first appearance on Broadway he received a Tony award. He has performed the one-man show more than 2,000 times in different locations across the United States, including at Mizzou’s Jesse Auditorium. Holbrook’s talents haven’t gone unnoticed, as he has been nominated for an Academy Award and a Screen Actor’s Guild Award for his performance as a supporting actor in “Into the Wild.” Holbrook also has been nominated for seven Emmy Awards and won five: two for Outstanding Lead Actor in a Miniseries or Movie for “Pueblo” in 1974 and “Sandburg’s Lincoln” in 1976; one for Outstanding Lead Actor in a Drama Series for “The Bold Ones: The Senator” in 1971; one for Outstanding Performance in Informational Programming for “Portrait of America (Alaska Segment)” in 1989; and one for Actor of the Year for “Pueblo” in 1974. Holbrook has three children, Victoria, David and Eve. Celebrated entrepreneur, mentor and community leader, Paul Sturtz is best known for co-founding the Ragtag Cinema and the True/False Film Fest. Sturtz’s efforts have inspired film professionals and artists in the world of documentary film and have energized, entertained and educated a city. Sturtz graduated from the University of Oregon in 1989 with a degree in journalism. After working as a reporter, Sturtz became the communications director for the Missouri Rural Crisis Center, a statewide, family-farm organization with a mission to preserve family farms. In 1998, Sturtz became the business writer for the Columbia Tribune and later was hired as a city editor at the Columbia Missourian from 1999 to 2001. Sturtz also co-founded the Ragtag Film Society with David Wilson in 1998 and has worked as the head programmer at Ragtag Cinema since May 2000. Under the leadership of Sturtz and Wilson, the theater was selected as one of the 14 outstanding arthouse cinemas by the Sundance Institute in 2006. Sturtz and Wilson co-founded the True/False Film Fest in 2004, and Sturtz has served as its co-director and curator since then. The documentary festival has given Columbia and the University of Missouri a recognizable presence and an outstanding reputation in the world of documentary film. Strategically positioned a month after the Sundance Film Festival, the True/False Film Fest has become the natural next stop and one of the world’s leading documentary festivals. The rapid rise of the True/False Film Fest is due to Sturtz and Wilson’s ability and dedication to bring acclaimed and undiscovered films to the festival. In light of True/False’s popularity, Wilson and Sturtz established the True Life Fund in 2007. The fund provides financial support to documentary subjects. In its first year, the fund raised $8,500 to purchase school supplies for the South African Children’s Choir featured in the documentary “We Are Together.” Since it started, the fund has awarded more than $200,000. Sturtz has worked as an associate programmer for the Sundance Film Festival and has served on film juries around the world. He currently programs films for the Ragtag Cinema in Columbia, the Moxie Cinema in Springfield, the Capitol City Cinema in Jefferson City and the Lyric Cinema in Fort Collins, Colorado. In 2012, to coincide with the 10th anniversary of the festival, Sturtz co-directed his first film, “Dear Valued Guests” about the late, and sometimes lamented, Regency Hotel. In 2013, Sturtz was selected along with Wilson as one of 40 people or companies on the inaugural Indiewire Influencers List, on which they were described as “visionaries that are changing the course of film.” Recently, Sturtz was named creative director of Wind-Up Fest, a nonfiction festival in Williamstown, Massachusetts. Celebrated director, producer and impresario David Wilson is best known for co-founding the Ragtag Cinema and the True/False Film Fest. Wilson’s efforts have provided Columbia and the University of Missouri with a recognizable presence and an outstanding reputation in the world of documentary film. Wilson is the son of Willy Wilson, a staple of Columbia’s theater and arts scene, and former state representative Vicky Riback Wilson. David Wilson grew up in Columbia and attended Rock Bridge High School before studying filmmaking at Hampshire College in Amherst, Massachusetts. He graduated in 1996 with his thesis film “Kansas Anymore,” a fiction film about a band struggling to make it home. In 1997, Wilson met Paul Sturtz at a concert in Columbia. Sturtz approached Wilson about starting a film series, and the Ragtag Film Series began. After five film seasons, the Ragtag Cinema, Columbia’s first successful arthouse theater, was built in May 2000. Wilson returned to filmmaking, producing “Magic City” in 2000, a short documentary that illustrates the evolution of youth culture in the small community of Moberly, Missouri. In 2003, he relocated to Washington, D.C., to co-create an experimental opera, “The Nitrate Hymnal,” with Bob Massey. The multimedia work featured a hybrid orchestra of both punk and classically trained musicians and told the story of a grandson and grandmother attempting to connect via home movies. In 2004, Wilson returned to Columbia once more to launch the True/False Film Fest with Sturtz. Uniting the Missouri Theatre, Blue Note and Ragtag Cinema, True/False temporarily transformed downtown Columbia, capturing a crowd of 4,400 people in its first year. By 2015, ticket sales surpassed 45,000. Strategically positioned a month after the Sundance Film Festival, the True/False Film Fest has become a natural next stop and one of the world’s leading festivals for nonfiction film. The rapid rise of True/False is due to Wilson and Sturtz’s commitment to scouting the globe to secure already acclaimed films and discover new ones for the fest. As True/False grew, Wilson and Sturtz established the True Life Fund in 2007. The fund provides financial support to documentary subjects. In its first year, the fund raised $8,500 to purchase school supplies for the South African Children’s Choir featured in the documentary “We Are Together.” Since it started, the fund has awarded close to $200,000. In 2010, while continuing to work with True/False, Wilson produced “Big Birding Day,” a short film about competitive bird watching. The film premiered at South by Southwest, a prestigious festival in Austin, Texas. That year, Wilson also was named one of Filmmaker Magazine’s 25 New Faces of Independent Film.